Caitlyn Jenner and Ellen DeGeneres show love and generosity to a struggling black trans woman with dreams of a nursing career. Even if she knew it was coming, Blossom Brown of Mississippi had no idea how dramatically her life was about to change this past Tuesday. She sat in the green room backstage at the Ellen show, staring into a camera and hearing Ellen DeGeneres ask her questions from the set's trademark white couches. “I can’t see you so well," said DeGeneres, as they talked to each other on the show's season premiere episode. "Why don’t you come out here with us?” she asked Brown, who recently appeared with DeGeneres's guest, Caitlyn Jenner, on I Am Cait. Brown, an avid fan of Ellen, sprang up with joy in her floral print red and white jumper, and raced out to the set to greet DeGeneres and Jenner. She told The Advocate last month how stunned she was when she found out, watching Jenner's show, how the former Olympian had planned to help her. This was that moment: Jenner made good on the promise she made on her docu-series, according to E!, presenting her with a check for $20,000 to use toward her studies. Brown is 28, and a black, Christian, transgender woman from the deep South. She studied public health at the Mississippi University for Women and always dreamed of being a nurse. She is a volunteer for the Human Rights Campaign, where she recently wrote a blog entry about her life, and last December HRC featured her in a groundbreaking ad as part of a series to raise public awareness and "change hearts and minds" about LGBT people, as previously reported by The Advocate. Brown told Jenner about her firsthand experience with transphobia on the September 6 episode of I Am Cait. “I couldn’t get into nursing school for like the sixth time because I’m trans. People were looking at that and you need to be looking at my hard work and the dedication that I put into that hard work,” explained Brown. That episode detailed how Brown met Jenner at the HRC's San Francisco office as part of an educational discussion of the struggles of transgender people. Brown's tale of her six-time rejection to nursing schools, despite what she said were her straight A's, high GPA, and good ACT test score, moved Jenner. Later in that same episode, Jenner told her show's executive producer Andrea Metz to put together a video of Brown's story for DeGeneres, and to ask the host to invite her on her show, so she could help Brown offset her nursing school expenses. The $20,000 check was cosponsored by Shutterfly and will help Brown attend the nursing school of her choice. “Jenner has ‘the biggest heart,’ as friend Chandi Moore put it,” noted Adam Carlson for People Magazine. The struggles for access to education for transgender Americans like Brown are real and arduous. Yet, along with these struggles, there is cause for optimism. Ayana Elliott serves as Director of Health Services at the University of the District of Columbia and she holds a doctorate in nursing. The celebrated black transgender journalist Janet Mock featured Elliott four years ago in a blog post on Mock’s website, extolling Elliott’s work as a mentor for youth at New York’s Hetrick-Martin Institute. There, Elliott's “Woman in Me” program empowered youth to lead healthy lives. Elliott’s example as well as the gift by Jenner and DeGeneres offers hope for Brown as she fights for access to health education. 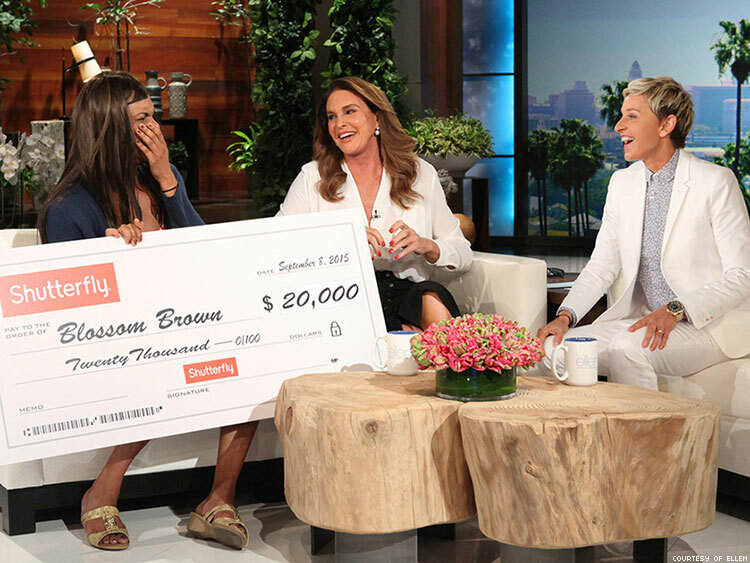 Watch the clip from Ellen below, in which Jenner and DeGeneres present Brown with the check for $20,000.